Benedict Cumberbatch, I knew you were the type to look off-duty dapper, but I didn’t think that you could also do downright cool. Your bomber and denim combo shows me that you can, in fact, do casual cool just as well as red carpet ready. Even though you’ve made a steady showing in previous years’ Men’s Style Madness, is 2017 the year of Cumberbatch? Rami Malek, on the other hand, is never not cool. Whether its a bomber, a suit, or a Hawaiian shirt, Rami nails the fit, color and visual interest categories with flying colors. Plus, he clearly doesn’t take his “aesthetic” too seriously, because he’s game to throw some funny faces on the red carpet – who doesn’t love that kind of confidence? Whether it’s a few breath mints or a favorite fragrance, Rami definitely has some tricks up his sleeve to keeping his cool. Anyone who was listening to Megan’s live recap on Instagram Stories last night heard about Joe Biden’s run in with a dog named Biden, and you know that his style runs deep. When he’s not donning a suit, the former Vice President rocks dark denim, aviators and his amazing leather bomber on his days off. He definitely makes a case for minimal wardrobe. 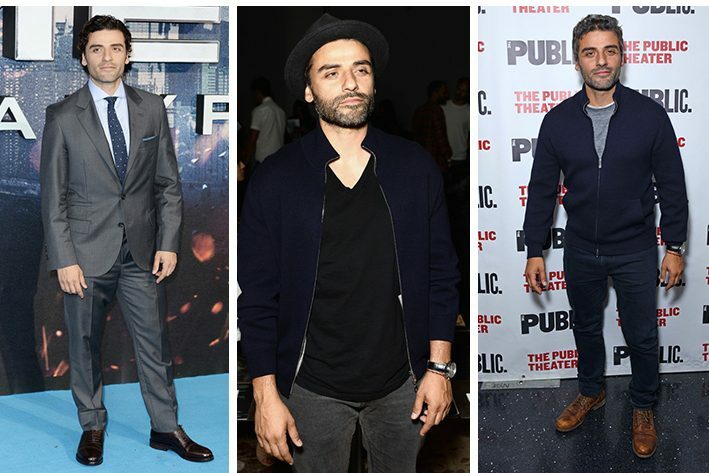 Oscar Isaac is the kind of guy who knows how to use a hat on a bad hair day to make you think he’s really having a good hat day. His causal style never feels too curated, but the fit is always spot on, and even in formalwear he knows how to flatter his frame. Plus, that 5 o’clock shadow is totally effortless chic for men – next time you think about going for a shave, try sudsing up but letting it grow a little a la Oscar. We’ve had some industry members in past years of Men’s Style Madness, and this is where we’ve seen traditional celebrity break their stride – Wooster lost to Ryan Gosling not once, but twice, both years in Round 2. Will this menswear blogger be the change this bracket deserves, or is he not the one we need right now? I think we can all agree that his knack for double breasted suiting is pretty impressive. Riz Ahmed’s Valentino suit is a sartorial mike drop – tailored to perfection, covered in stars and flowers, and just crazy enough for an event like the Elle Style Awards. Granted, he also looks just as good in a plain black suit because, again, tailored beautifully. The (kind-of) off duty style is really wear where the money is though – at his chats with Kiss FM UK, he looks just as sharp as he does in suiting. By no surprise did Idris Elba make it to Round 2 – last year he went all the way to the Elite 8. Elba’s style is the perfect blend of modern and classic, with perfect fit and a great dash of color. His style is definitely the kind that every guy could pull off, but not every guy thinks to put together, which is what make’s his style a game changer. On Instagram Stories with Megan last night, Megan called out that the thing that’s interesting about Sam Hunt’s style is his appreciation for trends that aren’t usually represented in his category of music. While his musical genre is country, his style can read more pop star. His confidence to go against the grain of his corner of the industry is definitely a cool move, and could make him a catalyst for a style change for all country musicians. WHERE DO YOU WANT TO SEE AN UPSET?